Shuffling away from the Boleyn on Saturday and heading for a mid-afternoon livener--the best thing about lunchtime kick-offs because the results and performance always seem to be rubbish--surely everyone was left with the feeling that the current situation at the club is doing no one any good. Not the team, not the manager, not the board and certainly not the fans. One win in ten league games, a constantly reported impasse over Big Sam’s contract, and a set of players who look to be affected by the whole thing. Now I am not going to air any view on whether Sam should go or stay, that is not the point of this, but we are wasting a strong start to the season with this current void, with no clear direction from the board and seemingly constant infighting. One question first. Why do clubs treat managers’ contracts any differently to players? Be certain that is what is happening at West Ham. Rightly, players who are nearing the end of their contracts are involved in on-going negotiations. In fact, top players look upon it as a lack of respect (and almost an invitation to leave) if they are not well on the way to a new deal before the turn of the year ahead of a summer end of contract. That January is the time they are allowed to talk to overseas clubs. Both James Tomkins and Mark Noble have signed new deals, rightly so, long before the end of their current deals, there have been long-running negotiations of sorts with Winston Reid and we hear that James Collins is also going to get a new deal. And we have moved heaven and earth to keep promising youngsters Reece Oxford, Reece Burke and Joe Powell at the club. Players like to be certain of their futures. So if West Ham can negotiate with players, why not the manager. Why does he have to wait until the end of the season? Surely nothing is going to happen in the last 11 league games to change what many believe are already fairly entrenched views, or so we are led to believe from co-owner David Sullivan. I believe there is a feeling certainly around the training ground, that because Big Sam is an argumentative, opinionated old cuss, that the board are teaching him a lesson by showing who is really boss. Because they can and it massages their own egos. There seems so much acrimony over transfers and who does what, that Sam is being put in his place. Certainly, around the game, the reputation of Sullivan’s transfer dealings do go before him. Sam was probably warned. Anyone who takes over at West Ham will already know that Sullivan likes to run the show, believes he can do a better job in the market that many a manager, and frequently says so. An interesting piece in the Guardian on Saturday by David Hytner said as much, and to be frank, most of the stuff in the article is pretty well known to West Ham fans who follow the Boleyn soap opera. But he clearly explained the problems between manager and chairman. There was also a piece last week by Steve Bates in the People making it clear that Sam would be no push-over in any dealings, he will not be grovelling to keep his job. Bates, a top sports writer in the north for many years, had great contacts at Old Trafford--his father in law is David Meek, who was the highly respected Manchester Evening News correspondent who also wrote Fergie’s programme notes for years. Bates would also know Sam from way back, so anything he writes on the subject is well worth taking note of. 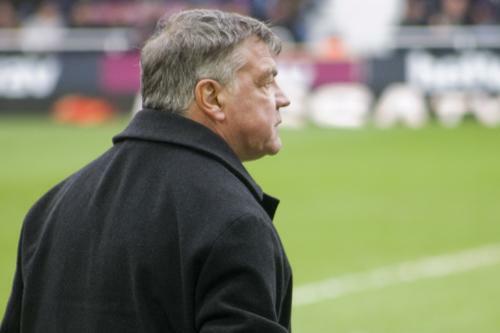 So while there is a large body of Hammers fans who want to see the back of Sam, and others who will tolerate his continued employment under sufferance, inside the professional game there is a strong feeling that Sam has done a very good job at Upton Park. I also noticed that Matt Lawton in the Mail remarked that he did not understand what our fans’ problem was with Sam, and that he had done a more than decent job. I am not sure where to start with that one, I could point Matt in the direction of a ground full of Sam doubters. It is obvious now that the problem has become serious and it is affecting the players. I note that Stewart Downing and Adrian have both gone into print claiming that the manager--who has had a big impact on both their careers this season--is doing just fine. So I don’t believe really Tomkins’ remarks that the players are not being affected by the current situation. He would have to say that, wouldn’t he? No, there are suggestions that an air of uncertainty and in some cases, despondency, has started to hang over Chadwell Heath. Many players are unsure of their futures, always the case when a manager changes anyway because one could be a darling for one manager and not the right cup of tea for another. And no, I don’t just mean Kevin Nolan. There is also concerns from the general backroom staff, some of whom do not know whether they will be employed next season. None of this helps the situation, and surely should be a reason for the board to change their often reported view that they only change managers at the end of the season. If they cannot see that the current impasse is affecting performances on the field, they are not watching the matches I am seeing. At West Brom the whole atmosphere was wrong. And against Crystal Palace, despite being more than unlucky again with refereeing decisions and two outstanding efforts that struck the woodwork, there just does not seem the urgency and vigour of early season. Palace should have had Glenn Murray sent off before he had scored his goals, while Mile Jedinak should have been red carded and conceded a penalty for that shocking elbow into Diafra Sakho’s head. Where was referee Mike Dean looking? We were 3-1 down at that point having defended set-pieces like a pub team, but a penalty and then a last-ditch onslaught against nine men could have salvaged something, even if undeserved. But three points from the last 30, and down in ninth spot with Chelsea and Arsenal next suggests things are not going to improve any time soon. Even David Gold’s comments about the team selection and substitutions being right, was faint praise for the manager, who he did not mention once by name in his blog on the impressive new club website. What we have now is general uncertainty, players who know they are not going down and a manager who will certainly not walk away with another--probably--big bonus at the end of his contract for keeping us in the top flight. He got one last summer, so I would be more than surprised if something similar was not written into the current deal, which does not end until the last day of June. How can we be planning properly for next season in the current climate. Alex Song is again being linked with Liverpool, Reid’s on his way, Enner Valencia has had hit head turned by Chelsea and Manchester City are seemingly looking at Aaron Cresswell. Carl Jenkinson’s future is equally uncertain, and that’s half a team worrying about their futures. Of the Day and see their analysis of Reid and Tomkins to know things were not right. If we had spent half the week looking at Palace set pieces as Sam says, someone was not listening! Funnily enough, if we had won only one of the first ten league games, Sam would have been on his way. He has admitted that, but those 17 points from the first ten games have given him the cushion and a strong bargaining position. Plus an enhanced CV should be shown the door. There was talk of him going to Aston Villa while Sunderland also have been linked with him. One thing has to change is the two separate recruiting teams we have. There is Sullivan, with Tony Henry reporting directly to him, along with Barry Silkman at his elbow. While Sam has his own agent Mark Curtis and his trusted chief scout Martin Glover. It is a ridiculous situation and is clearly causing untold conflict. You wonder whether any future West Ham manager, from home or abroad, would tolerate such nonsense. I can assure you that someone like Rafa Benitez or David Moyes would not have one ounce of interference from boardroom level when it comes to transfers. Certainly not in the selection of targets. So something has to be done from top level to ease the passage of this club going forward, and if that means talking to Sam now or just saying that he will not be offered a new contract, then so be it. Better that than the continual drip drip of unaccredited quotes that we are getting. The rumours that some sort of four-year contract was tentatively offered last month, if only as a starting point for negotiations, won’t go away. Some seriously respected journalists believed there was something in that, despite Sullivan denying it. All that blew up ahead of the Albion disaster, and then we got a performance from the players the defied belief. It may have been a real red herring, but I have been told that the source for the initial rumour was usually very reliable. What is depressing is that we are witnessing a great season wither and die. There are some who believe that Sam has already been told he is history, others who are talking and writing about the management future as if Sam does not even exist. It is not a healthy situation. I recall writing earlier in the season, that if this campaign was allowed to fall away amidst bitterness, infighting and wrangling over transfers and agents, then Irons fans who have waited so long for a season of substance in the top flight would never forgive the people at the top who let it happen. That still stands as far as I am concerned. Get things sorted now, for all ours sakes.